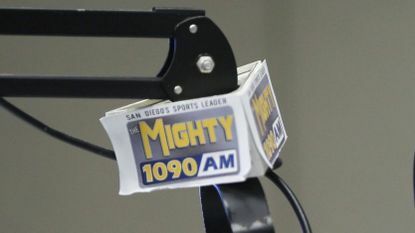 On Wednesday, San Diego’s most popular radio station went off the air unannounced leaving a massive void in the city’s sports media landscape. At about 1130 a.m. today, local sports radio host Darren Smith was preparing a segment on Padres Fernando Tatis, Jr. and Manny Machado when the president of the station’s parent company Broadcast Company of the Americas’ (BCA) Mike Glickenhaus walked in and called a full meeting. That meeting was to announce that the radio station had been taken off the air by the people who own the transmitting tower located in Mexico and that those same people were no longer interested in being in business with BCA. For many people in town, the Mighty 1090 represented the best sports radio in the city. The afternoon shows of The Darren Smith Show and Scott & BR being the most popular and in a constant battle for the top sports radio show in town, the station was the number one sports station in town. But with not much other details being made public yet, the end of the station leaves yet another hole in the San Diego sports scene. It was founded in 2003 by John Lynch, father of former Torrey Pines High School football standout and ex-NFL strong safety John Lynch Jr. The station’s roots date back to the old XTRA Sports 690. Pioneering the sports talk scene in California during the 1980s and 1990s with shows like Jim Rome and Hacksaw Hamilton, the station developed a strong following that carried over to the new station. After the relaunch under Lynch, the station experienced a resurgence by getting to broadcast Padres games beginning in 2004. 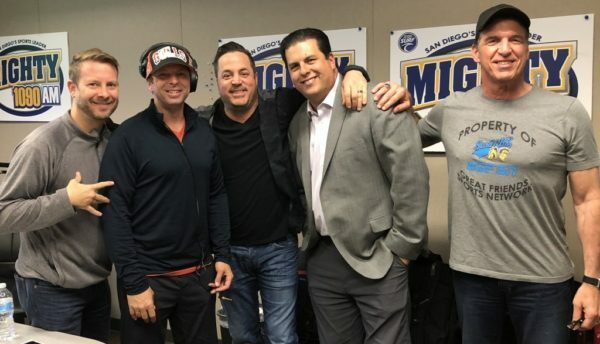 Darren Smith had recently arrived in San Diego and began hosting a very popular pre-game show with for the Padres and the launch of the Scott & BR Show; the station seemed like it was stable. But after losing the Padres to FM station 97.3 in 2016, ratings for the station began to fall. Buoyed by the fact that Chargers still called San Diego home and was waging a battle with the city for a new stadium, the station continued even though it was evident major changes were on the horizon. When the Chargers left town in 2017, the station ratings dropped even further. But despite losing its two biggest draws, the Mighty 1090 was still the highest rated sports station in town, and it wasn’t even close. The recent February Nielson ratings had the station draw a 1.6 share, more than double its closest competitor, the current home of the Padres FM station 97.3, that managed a meager .7 rating, and four times the depressing .4 Fox Sports 1360 pulled in. All this has to leave you to wonder how the most popular sports station can simply shut down one day with no announcement or word from the company. The people at the Mighty 1090 deserve better, and the people of San Diego deserve to hear the best sports radio can offer. We can only hope we will hear their voices again somewhere else. This was according to Nielsen Ratings. it wasn’t even close, really. There had to be a problem between the station owners and transmitter owners in Tijuana for them to just suddenly stop transmitting from their tower. That situation is unusual enough, with both the Mexican and US government communication agencies involved. Putting up a tower and setting up the transmitter isn’t quick or easy, and it costs a lot of money. If the station owners can’t come up with something, the bandwidth is likely to be sold by some other entity. Maybe that new owner will have the wherewithal to build a tower and transmitter somewhere. The station was a joke, no sense or pride at all. Darren Smith is from New York no allegiance to San Diego at all. The worst on the air today is Scott Kaplan I don’t even think the guys watch’s any sports. More into the bachelor. If this is great sports radio it is embarrassing. Wish they could taken dan siello with them. About time. RIP. I stopped listening to those douche bags over a year ago. Couldn’t stand their constant bickering and gossip sessions over streaming/entertainment options and reality TV BS. Even their sports related opinions were dog poo. Constant bashing of the beloved Padres and Chargers marked the end for me. Although, the (new) morning guys Ben and Woods were much more knowledgeable and tolerable to listen to. Nothing can match the old xtrasports690 back in the 90s. Darren Smith is by far one of my favorite sports radio personalities. This show is a staple in the city. I hope someone comes out to help save this station and the amazing staff there. I’ve listened to this station since I was a kid it’s heartbreaking to hear what’s happening to it.